We have been tracking some new Chromebases in development for some time so it comes as no surprise that the King of Chrome OS has now unveiled two new all-in-one devices. 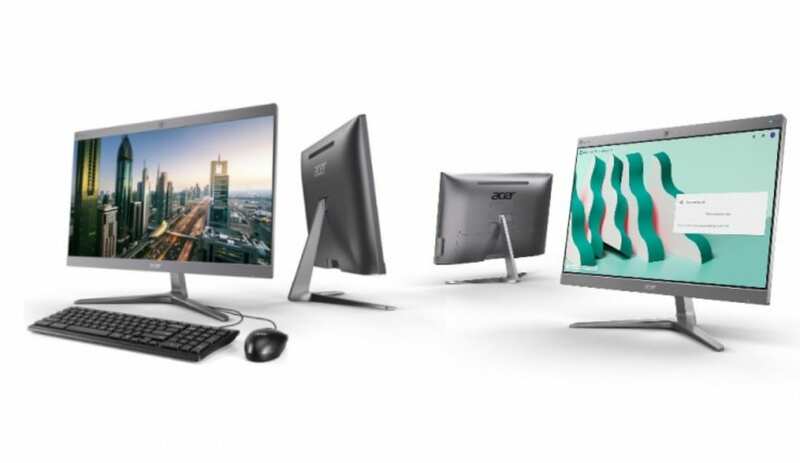 Announced at CES 2016, Acer debuted their first Chromebase device and it appears that they are banking on Chrome OS’s success in the Enterprise and EDU sectors as they take another swing at the somewhat niche form-factor. As expected, the new Chromebases will be powered by 8th gen Kaby Lake processors and will tout the very familiar, 24″ FHD display. We didn’t get a ton of details on the devices but it looks like the only major differences will be the internal offerings and the fact that one model is designed as a “for Meetings” device. The Acer Chromebase for Meetings 24V2 will come with a touch display, Core i7-8550U Intel processor, 8GB DDR4 RAM and a 32GB SSD. Focusing on the meeting space, it will be equipped with dual microphones and two stereo speakers for crisp, clear conference calls. Around the back, both devices will offer users four USB 3.1 ports, a USB type-C, HDMI, SD card slot and a RJ45 input for ethernet connectivity. Release dates and pricing are still unavailable but we have reached out to Acer for more details. We look forward to getting our hands on one of these machines and taking it for a spin. Stay tuned for more. Note: Acer’s press release states that the original Acer Chromebase was “the world’s first.” That is inaccurate. LG launched their Chromebase the year before in 2015.